LOS ANGELES, May 14, 2014 — WBC World-rated No. 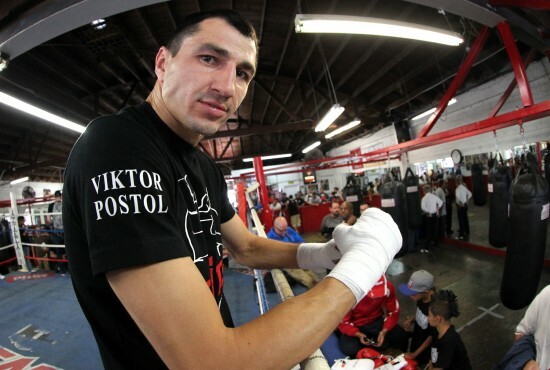 1 Viktor Postol (25-0, 10 KOs), of Brovarsky, Ukraine poses during media day in Los Angeles for his upcoming 12-round WBC super lightweight title elimination bout against WBC world-rated No. 2 Selcuk Aydin (26-2, 19 KOs), of Trabzon, Turkey on the Márquez vs Alvarado undercard. Promoted by Top Rank® in association with Zanfer Promotions, Márquez Boxing and Tecate, Márquez and Alvarado will collide at The Forum in Inglewood,Ca. on Saturday, May 17 and will be televised live on HBO®. Tickets are still available and are priced at $400, $250, $150, $100, $75 and $35. Tickets can be purchased at the Forum box office, all Ticketmaster outlets, Ticketmaster charge by phone (800-745-3000), and online at www.ticketmaster.com or www.fabulousforum.com.